Komaj, this Persion buns are flavoured with turmeric and cumin seeds which is stuffed with chopped dates, the addition of cumin and turmeric makes this Komaj very different from other bakes,and the most interesting part is these Persian buns are stuffed with dates, so both cumin,dates combination while having this buns sounds very much unique. I have already uses cumin in breads when its comes to savory,but this bread is very much different.Cumin is very much used in Persian cuisine as they are grown abundantly, obviously local Persian dishes are often flavored by cumin in combination with turmeric powder. 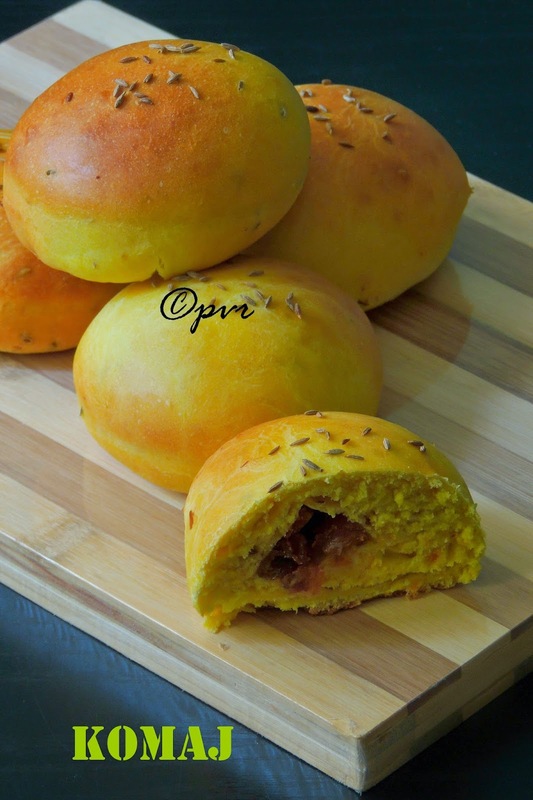 This sweet and savory bread is served with tea and you can find them in heart shaped buns, this is the way these buns are eaten in Iran. Komaj is this month's bread for We Knead To Bake, a monthly baking event by Aparna of My Diverse Kitchen. 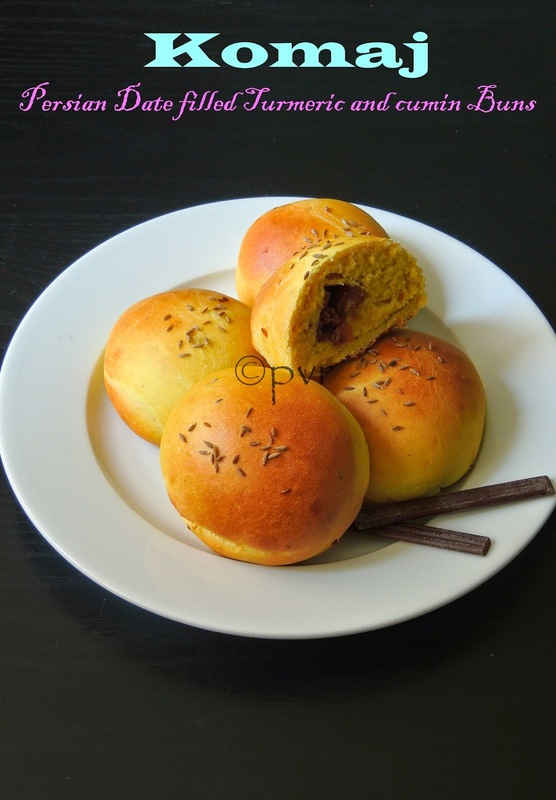 After 'Pain au lait', a French milk buns we are travelling towards Iran for making this interesting buns Komaj. I baked 5 komaj with chopped dates and finished the remaining with chocolate chips, seriously both dates and chocolate stuffed komaj tastes delicious. 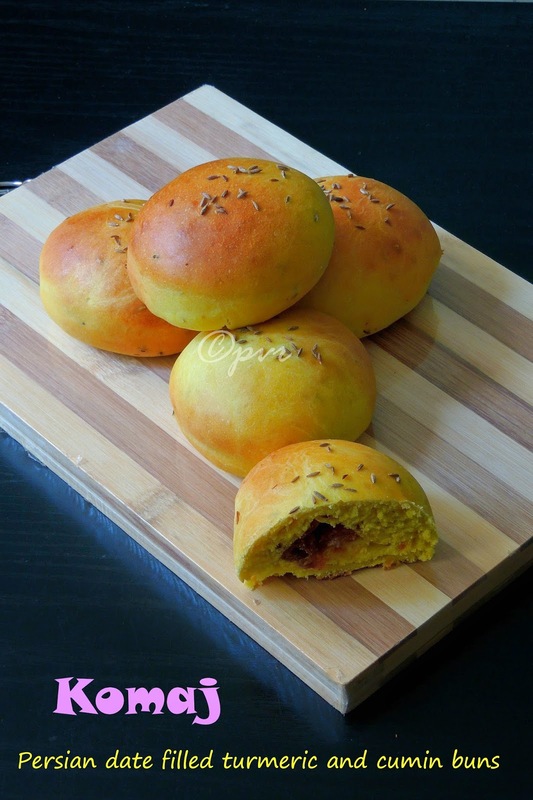 Definitely its worth to try this Persian spiced sweet and savory buns. Komaj suits prefectly for my theme of this week's blogging marathon, am running my last week of blogging marathon with an interesting theme 'Cooking with alphabets' in different method of cooking. From the list given by Srivalli for this theme, i picked K,V,O and cooked this week's blogging marathon's dishes with three different methods of cooking. Today's Komaj goes for oven aka baking method, tomorrow's post will be stove top method and the last one is going to be microwave cooking method. Eventhough this week's theme was bit challenging, i enjoyed thoroughly this week's theme.Check out the Blogging Marathon page for the other Blogging Marathoners doing BM#41. Add the yeast the warm water and keep aside until the yeast turns foamy. Take the flour, 2tsp crushed cumin, sugar, turmeric powder, salt in a bowl, and mix well. Add the foamy yeast, warm milk, yogurt, oil and knead everything as smooth dough. Shape the dough as ball and place it in a greased bowl, cover it, keep aside for an hour until it double its volume. When the dough has risen, deflate it, shaped it as a ball, and keep aside in warm place for an hour again. Meanwhile mix the chopped dates,butter and cardamom powder in a bowl for filling. Divide the dough into 4balls, cut them again as two, so that you have 8 pieces of the dough. Work with one portion at a time. Roll each dough as a rectangle with 1/4inch thickness, brush it with water, place a teaspoon of filling almost towards a corner of the rectangle, dont keep too much of filling. Bring the other side of the rectangle and cover the filling completely. With a round cookie cutter, cut the dough with filling as round buns. Continue the same process with the other pieces, collect the remaining doughs to form two more pieces. Arrange the unbaked buns in a baking sheet lined over a baking tray. Bake the komajs for 10-12minutes. Let them cool in wire rack, dust it with icing sugar if you like. These buns r just perfect!!! Beautifully and perfectly baked buns. They look so tempting. ..must say you are a thorough pro. Priya. These buns with dates or chocolate chips all look and sound very nice! Priya, trust you to plan so well..:)..what a lovely way to cook K and especially in different modes..great job..the buns are so sinful! Buns looks so tempting and just like store bought ones...hats off to ur baking skills ! I am just posting the same now.. they were so delicious. Such flavorful and yummy looking buns. Flavorful and tempting rolls Priya! very beautiful buns so perfectly made too. Love it. The buns looks so good. They are shaped perfectly. I tried this one too but did not like the flavor combination. Good to know you all enjoyed it. Perfectly made buns and love the flavors in them -- so yummy.